With the first light of day the residents of the small fishing village of Loanco walked from where they had taken refuge a few hours earlier, over the hill to a spot where they could see their small town below. Their worst fears were realized: the whole town was totally destroyed by the tsunami. Most of the homes and fishing boats were gone. 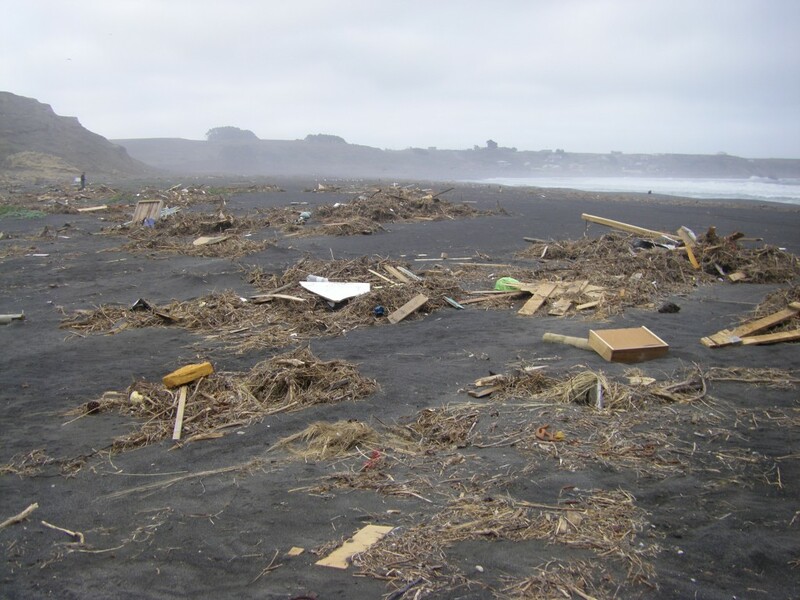 There was debris everywhere, their homes and boats shredded and strewn up and down the desolate two mile sandy beach that runs north from town to the mouth of the Loanco River and the Carranza lighthouse. On that morning, the 28th of February, 2010, the humble people of Loanco began to rebuild what had been a quaint, picturesque artisan fishing village that offered visitors simple seafood restaurants, rustic oceanfront camping, the legendary Santos del Mar, and boat trips to observe close up the sea lions which inhabit a chain of offshore islands. Where colorful fishing boats had dotted the beach in front of the town, there was nothing but heartbreaking remnants of the only means of livelihood the artisan fishermen of Loanco owned. The concrete structure that had served the fishermen as a place to store their equipment and clean and market what freshly caught fish was totally gutted by fire. 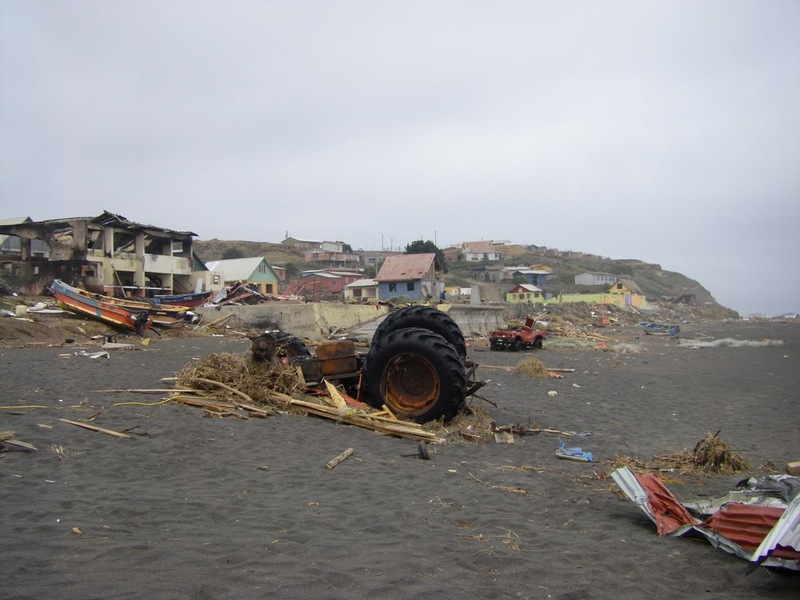 Most houses along the unpaved street running along the beach were flattened or pushed up the hill behind. The most popular restaurant, Las Rocas, which had sat at the end of the street looking out over the beautiful harbor was gone, as was the only store offering basic provisions; both were owned and operated by Dago and Maria. 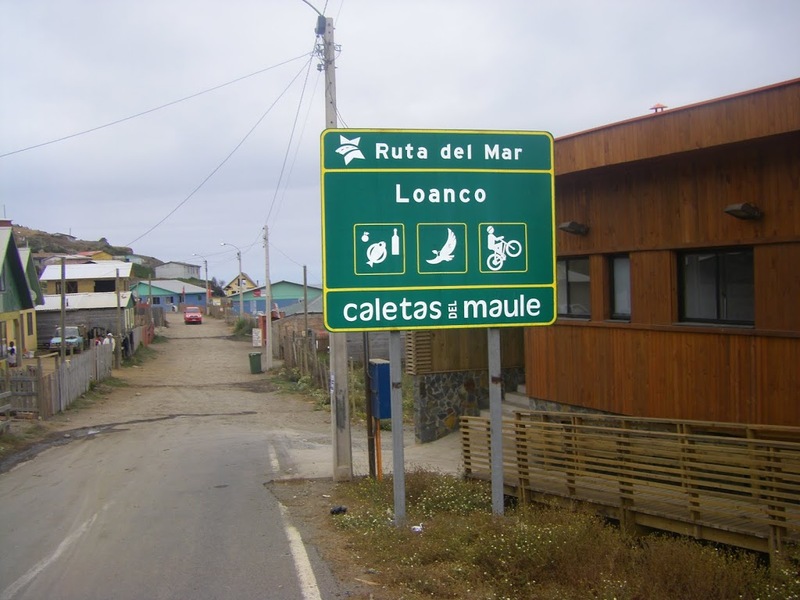 Loanco is one of a chain of small artisan fishing villages on the southernmost stretch of the Maule Region coast that includes Los Pellines, Curanipe, and Pelluhue. 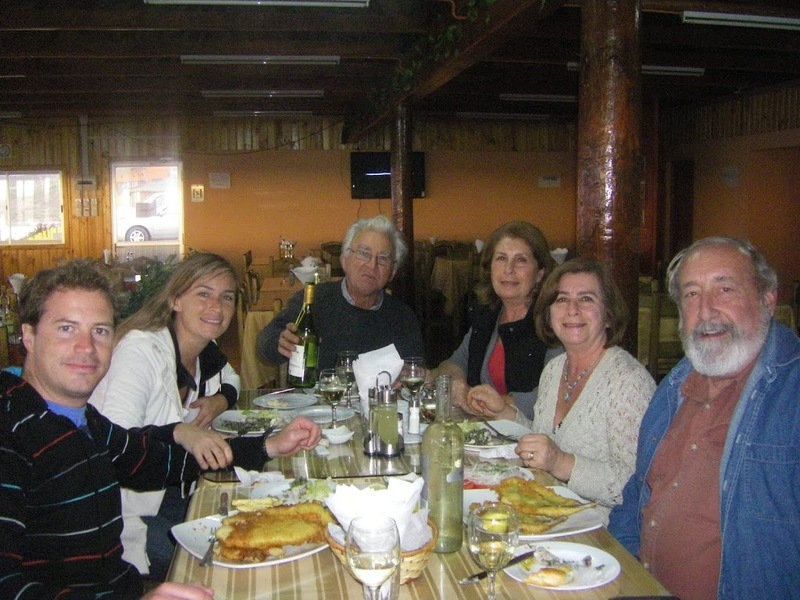 Prior to the tsunami in 2010, visitors from close-by urban centers like Talca and Cauquenes could spend a pleasant day in Loanco, to have a leisurely lunch of fresh local seafood. Raw mussels, usually the larger version named cholgas, sea urchins they call erizos, and a mixture of raw clams, mussels, sea squirts (piures), and pieces of squid (calamares) were the usual first course offerings. 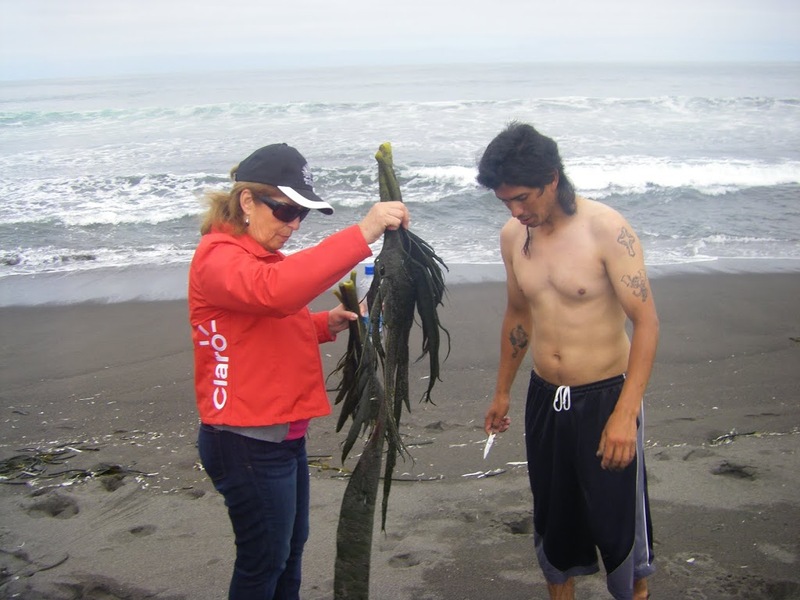 Next, Maria would most likely serve deep fried or grilled hake (merluza or pescada), sea bass (corvina), or the almost boneless eel-like conger eel or Kingclip (congrio), with the most common Chilean salad made with fresh tomatoes, blanched onions, topped with parsley. But you could also order, depending upon availability for these products are scarcer, Chilean abalone (locos) topped with homemade mayonnaise or a chopped parsley/onion in olive oil mixture called salsa verde, a baked crabmeat casserole called pastel de jaiva, or the classic caldillo de congrio, a steaming soup made with a large piece of conger eel, sliced potato, slivers of onion, a bit of tomato, and maybe some carrot and cilantro. A few glasses of cold white wine, a slab of carmely custard, leche asada, topped off with a cup of Nescafe, still the most common everyday coffee in Chile. 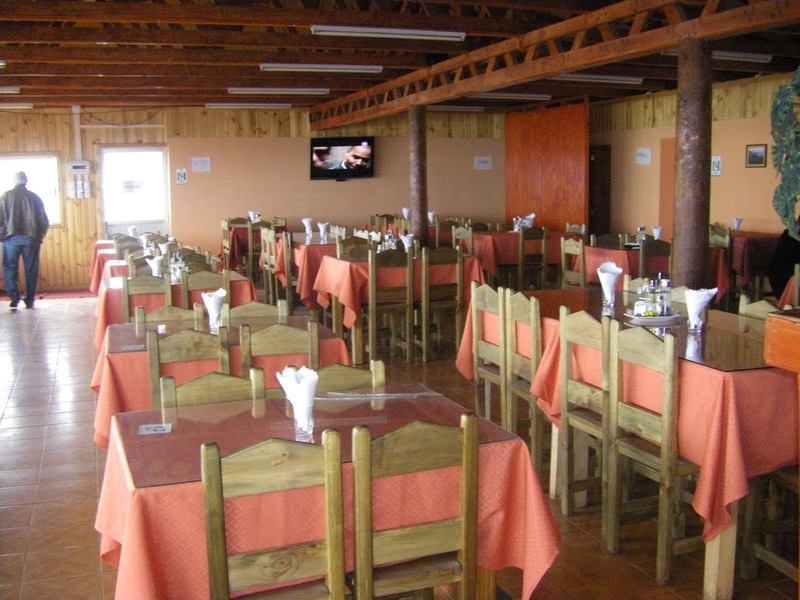 Although it provided very simple fare, the spectacular panoramic view of the Pacific Ocean, the hominess of Las Rocas, the personal and friendly service by Maria and her staff, and the freshness of the seafood ensured that a weekday lunch in Loanco was a memorable event. After such a meal, a walk along the beach was called for, or a short hike along the rocky coast to observe the place called Santos del Mar. The 2010 tsunami was not the first time Loanco was the site of a maritime tragedy. Legend has it that many years ago a young man, working aboard a ship named the John Elder that went aground on the Carranza rocks and sank, survived by lashing himself to some water barrels and was washed ashore just down the beach from Loanco. As he was floundering about in the ice cold waters, fearing he would surely die, he prayed to the santos del mar, the saints of the sea, who he believed could save him. Apparently they did, and to this day visitors to Loanco trek down to the rocks at the end of the beach to observe what that young man saw when he regained consciousness: etchings in the rocks that appear to be saints and, in one crevasse in the rock, an image of The Virgin. To observe these images, it must be at low tide to reach the location safely, but also the lighting from the sun and reflections from the water must be just right. Additionally, it helps if your imagination is in fully vivid form. As an aside, an official report signed in 1892 in Valparaiso bears witness to the fact that the steamship John Elder, out of Liverpool, left Valparaiso on January 16, 1892, heading towards Talcahuano, to the south. Carrying 120 passengers, the ship did actually go aground on the Carranza rocks, due mainly to errors by the master and his officers, and sank. 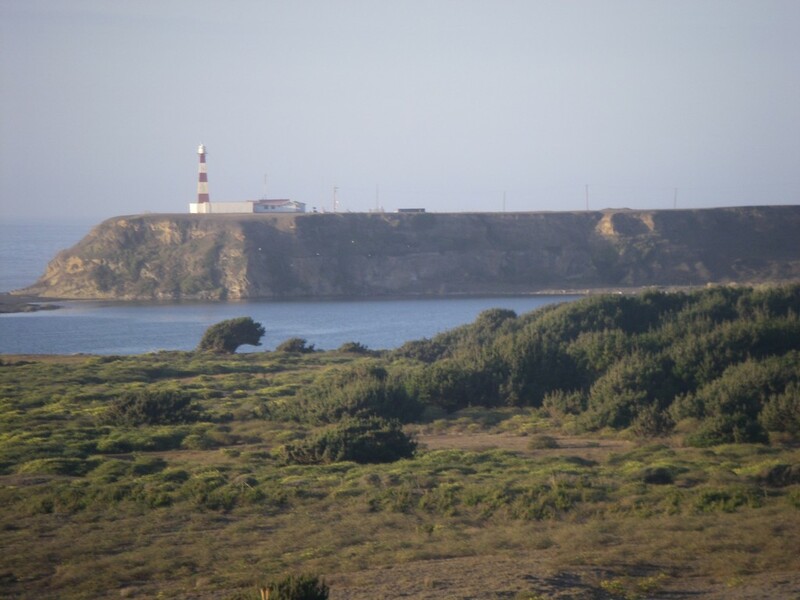 However, the report states that all 120 passengers were saved by going to shore in lifeboats, probably to Loanco, just a bit up the coast from where the young man was “saved” by the santos del mar. There is an appropriate Italian saying for this situation: “Se non e’ vero….e ben trovatto”. Just a few days after the tsunami of 2010, I visited Loanco. There are only two homes on the bluff overlooking the beach about a mile north of the village of loanco; one was built by Joaquin and Veronica (my wife’s sister) and the other by Joaquin’s sister Pacha and her husband Moncho. For several years prior to the tsunami I had spent time here; it is so picturesque and peaceful. I stayed in their home on this visit also, but as I looked out over loanco, I was appalled at how destructive the “Pacific” Ocean had been to this small, vulnerable town. I began what before had been a routine walk from the house, down the dunes and along the beach to town. But this time, I struggled haltingly, kicking debris and collecting up small remnants of life in Loanco; a piece of a sign, half an oar with the owners name painted on the paddle, things like that. In town, a couple of people were cleaning debris into piles to be burned, but the place felt desolate. 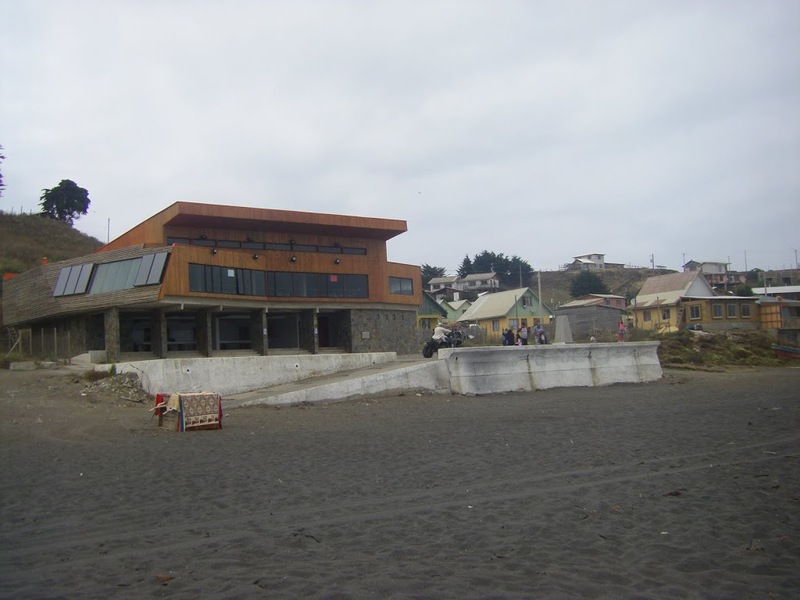 I walked up the beach and into the skeleton of the Las Rocas restaurant (Dago’s and Maria’s) where on previous visits I had stopped for a late morning vaina (acceptable pre-lunch drink in rural Chile made with port wine, ) and maybe a fried seafood empanada. Only a couple of walls still stood of this cement building. Dago had seen me looking over his place, so he walked down the dirt street from his house up the hill, to talk with me. Saddened but clearly not defeated, he swore he would rebuild his restaurant and store in the same spot, and all he asked of the local officials was that they build a storm wall between him and the beach to hold back the water next time. Doña Maria, Dago’s wife, seemed at that time to have a more cautious view than her husband of what they should do, suggesting that they most likely would find a place on higher ground to rebuild Las Rocas. But maybe not; only time would tell. Most of the villagers were somewhere else tending to their immediate needs, but I was told they would join up in the afternoon to work together to clean up the town. It was hard to leave Loanco that day, and harder still to be optimistic about Loanco’s future. Several months later, I returned to Loanco, and what I found made me ashamed to have doubted that this group of artisan fishers was up to the challenge of rebuilding their community. Again there were fishing boats on the beach, two new tractors to haul the boats out of the water, and ample evidence of homes being rebuilt. The next morning I walked into town, but it was a little early so there was no one around. I could tell by the tracks in the sand that at least some of the new boats had gone out to fish. 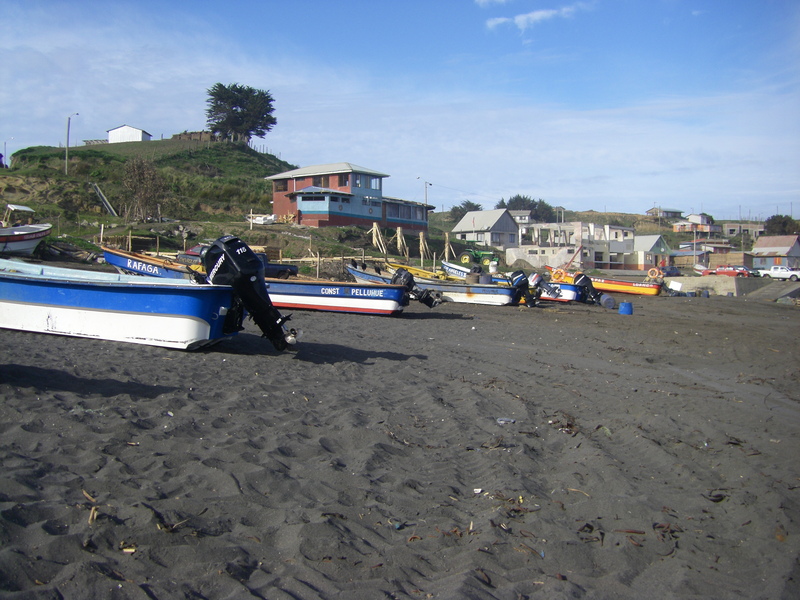 There were several new boats with shiny new motors, the product of contributions from a mining association from the north of Chile, the national airline, and others, and a special line of credit from the Chilean government’s fisheries ministry. The building used by the fishermen to store fish and fishing equipment, house bathrooms and changing rooms, and serve as a fish market when the catch was sufficient was still totally vacated and I was told it would be demolished. My next immediate concern was to check on Dago’s and Maria’s restaurant, for someone had told me they were again serving food in Loanco. As I walked closer to the site of Las Rocas Restaurant, it was clear Dago had decided to rebuild on the same spot, but it was equally clear they were not yet operating their restaurant there. 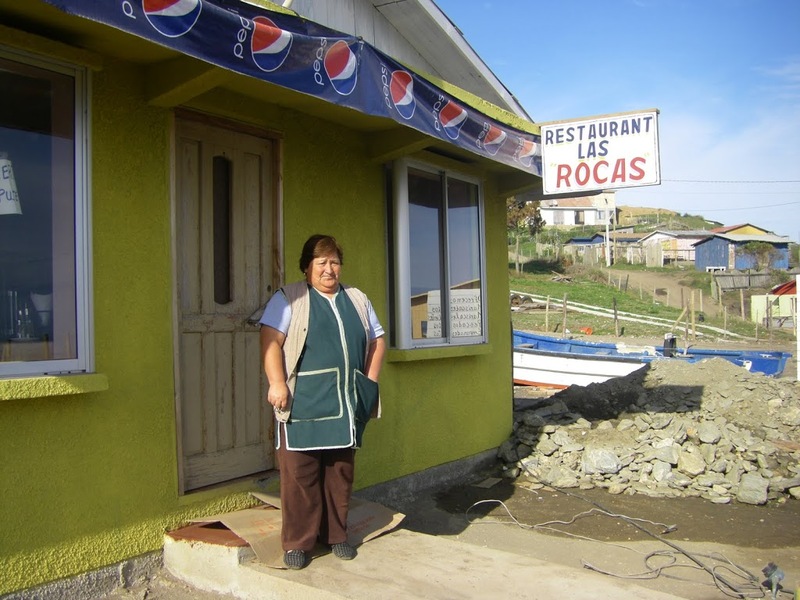 To my pleasant surprise, I saw a sign on the front of a small wooden structure down the street a bit, that said “Las Rocas”, and sure enough, Maria was running her restaurant there, while Dago finished the new restaurant. Maria greeted me with a big smile; she had apparently lost the discussion with Dago about where to rebuild their restaurant, and they would again provide a most spectacular ocean view, albeit somewhat precarious, to their customers. I had a long conversation with Dago, who explained his plans for a bigger and better restaurant; he was excited about the future, and since Maria was also excited, so was I. After all, how likely would it be for Loanco to suffer another “once in 100 years” tsunami any time soon? This time I left Loanco more optimistic. Several months later, a year after the tsunami, I again visited Loanco with my friend Gerry. As we drove into town, I thought to myself “This town is truly amazing in its small, isolated, stoic way”. A dozen families, artisan fishers of corvina, congrio and recently mostly merluza, in the year since the tsunami wiped out almost everything they owned, were making progress on rebuilding their homes, their community, and their lives. 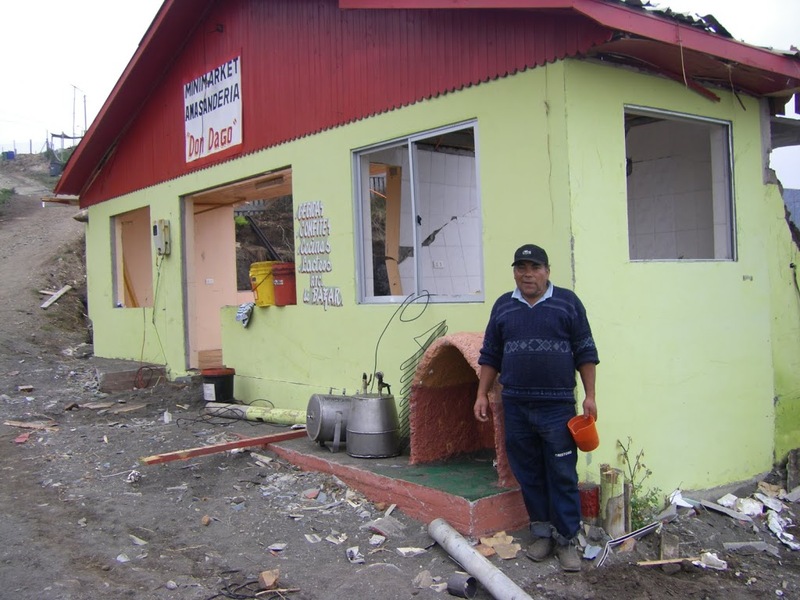 Dago’s and Maria’s restaurant, “Las Rocas”, was running at full speed, totally rebuilt in the exact location where it was wiped out by a wave of water a year earlier. Bigger and better, the new Las Rocas was nicer, the kitchen newer, and the bathrooms cleaner. We stopped at the restaurant to say hello to Maria, who was still there at about 6 PM, and to let her know we would be coming for dinner at about 8. I again felt very positive about the fate of Loanco as we drove back up the road and through the pastures across the tops of the dunes to Joaquin’s place, where we were staying. Joaquin was there, ready for us with a just-opened bottle of deep purple Cabernet sauvignon wine, produced at Moncho’s La Estrella vineyard and winery located several kilometers outside of Cauquenes. We had brought along some spicy Chilean chorizo sausage laced with the smokey toasted hot pepper and cilantro mix called merquén, some creamy, slightly aged Chanco cheese (most of which is no longer made in Chanco), and some freshly baked pan amasado, so we sat on the porch enjoying the panoramic sunset over the five-kilometer-long shoreline, and the Loanco fishing village, with Faro Carranza in the background. That night at Las Rocas Joaquin and I had corvina a la plancha (sautéed sea bass),Gerry the congrio frito (fried Kingclip, or conger eel). We washed it down with Missiones de Rengo Sauvignon blanc, a good, everyday dry white wine found in wine shops throughout the US and often served in social events in Chile, like weddings, receptions, and group dinners. It is a very good value, and when paired with Maria’s fresh fish at Las Rocas, contributed to a top notch meal. As we left Las Rocas, Joaquin gave us a short tour of the new fisherman’s building that was recently built where the old fish cleaning and equipment storage area used to stand. This new establishment, completed in just a year after the tsunami, seemed quite an accomplishment. Only several months before there had been a flashy article in Chile’s leading newspaper announcing that several functional but attractive buildings were being designed by a group of university architects to be built in fishing villages along the Maule coast, establishing La Ruta de Las Caletas (The route of fishing Villages, copying the already successful Rutas del Vino, wine routes, throughout Chile). I was very skeptical that this project was ever going to materialize, but to my astonishment, and great satisfaction, the one in Loanco was already finished. A restaurant was included in the project, but it was not yet functioning, nor did anyone know for sure who would run it and whether or not it would serve just fishermen or also the public. Would it draw clientele away from the other restaurants in town, including Dago and Maria’s Las Rocas, or would it attract more visitors to Loanco and increase the business in town for all. This new attractive structure was, at the time, surely a source of pride for the town, for the fishermen and their families, and I thought it deserved high praise. 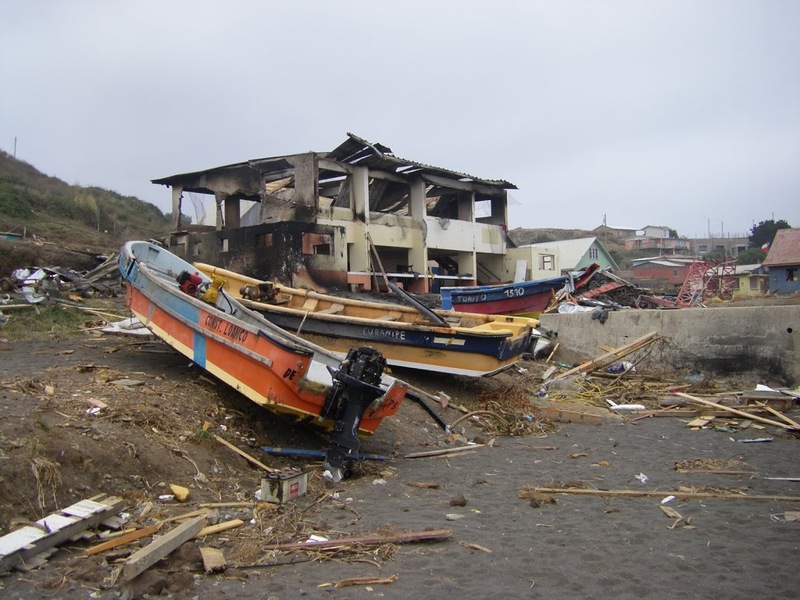 I had a feeling the Ruta de Las Caletas might after all become a reality, thus keeping an important promise made to the poor fishermen in these villages immediately after the disaster a year ago. Again we settled onto the front porch of Joaquin’s ocean-view home, and finished the evening off with a single malt scotch we had brought along in our “traveler’s emergency tool kit”, and small Cuban cigars Gerry finally released from the inside pocket of his jacket after much coaxing. We sat silently, trying to imagine what the inhabitants of Loanco had been through since the night the sea took their village, thoughts made more real by the incessant thunder of the breaking surf on the shore below. Sleeping in this place overlooking Loanco and Faro Carranza is a dream, be it because of the day’s activities, or from the Maule wine we always share, or the glass of scotch that often follows, or just the lulling sound of the surf, but sleep here is always profound and uninterrupted, and this night was no exception. We arose the next morning to a breakfast of sliced ham, fresh cheese, toasted pan amasado covered with wild blackberry jam, and a hot cup of instant Nescafe with milk. I don’t know what it is about the instant Nescafe in Chile, but it is delicious. Maybe it is the small container woven out of a willow reed, mimbre, that holds the can, or the fond memories of those breakfasts shared in southern Chile with my colleagues at the Instituto Forestal when I first explored southern Chile years ago as a Peace Corps Volunteer, that makes the coffee taste so good. However, I have always suspected that Chilean Nescafe contains something besides coffee, maybe ground garbanzo beans, I don’t know for sure, but it would not surprise me if it was really a special mixture found only in Chile. Nescafe doesn’t seem to taste near as good anywhere else. We finished breakfast and returned to Loanco to observe the arrival of the fishing boats after their early morning fishing. 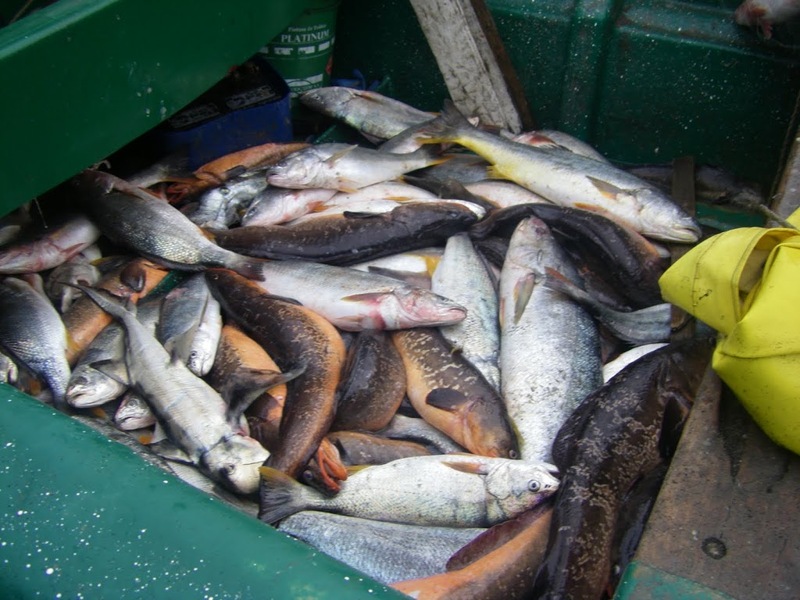 To our surprise and their great satisfaction, the boats were arriving loaded with fish. The fishermen told us this had not been common over the past year, but that maybe, just maybe, the fish were returning after a year of very bad fishing in the waters especially affected by the tsunami. Everyone was very excited about the number of large corvina and congrio colorado they had caught. 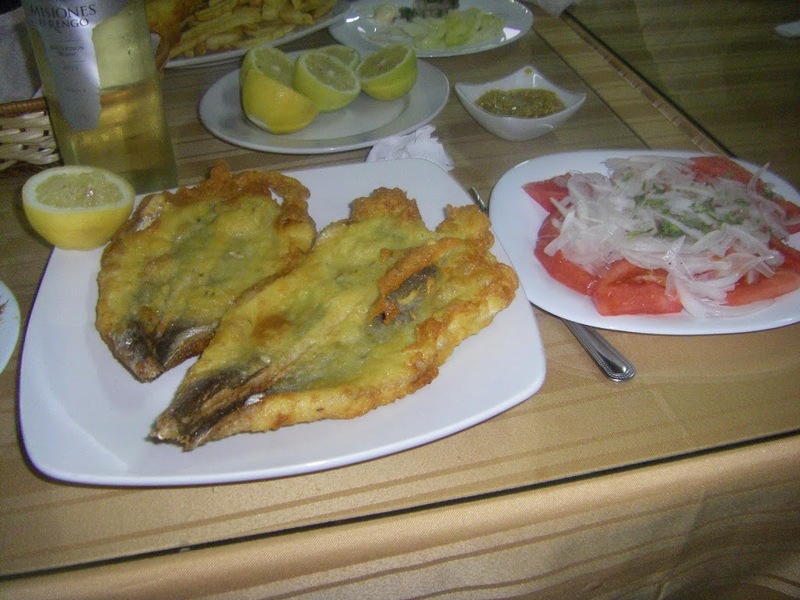 They even had a few of the flat lenguado, a type of flounder, my favorite Chilean fish that over the past few years has become very dear, and very expensive in Santiago restaurants. I like lenguado best when Ximena lightly sautés fresh filets in a bit of browned butter and chopped fresh parsley, and serves it with steamed broccoli, all splashed with fresh lemon juice and a pinch of black pepper. Oh yes, and a glass of Veramonte Sauvignon blanc from the Casablanca Valley (screw top notwithstanding). I was really optimistic about Loanco’s continuous bout with the Sea; they seemed to be holding their own, just a year after the disaster, if not outright winning the struggle. 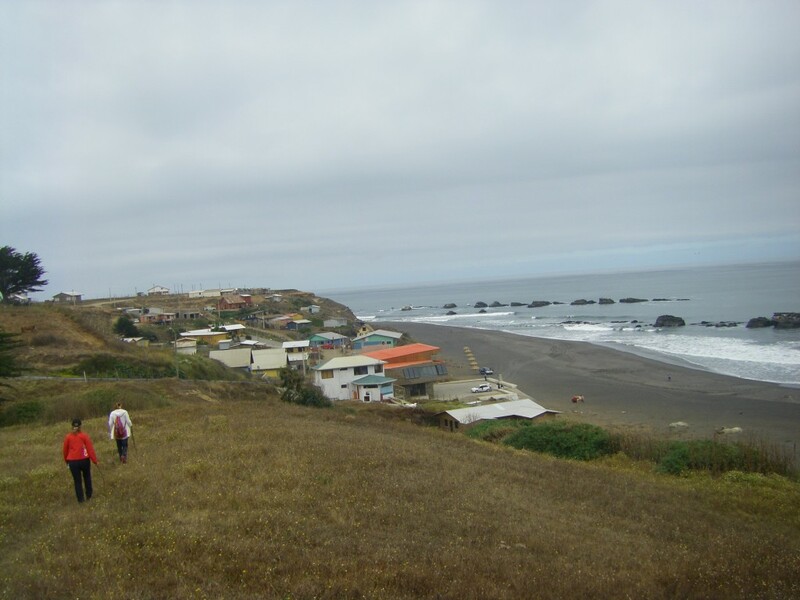 We did not visit Maule and Loanco for another year, but Ximena and I did finally schedule a trip down the coast of Maule, from Constitución to Curanipe. We approached Loanco from the north, passing over the Carranza River, past the lighthouse, the wind farm with its twin windmills, the silicate extraction plant, and onto the winding road that leads to Loanco. Along the way we bought several fresh merluza filets at a roadside stand and drove to Veronica and Joaquin’s home on the bluff overlooking Loanco and the lighthouse. We unloaded our bags from the car, and were immediately treated to “El Faro happy Hour”: slices of mild Chanco cheese, spicy salame, and pisco sours. 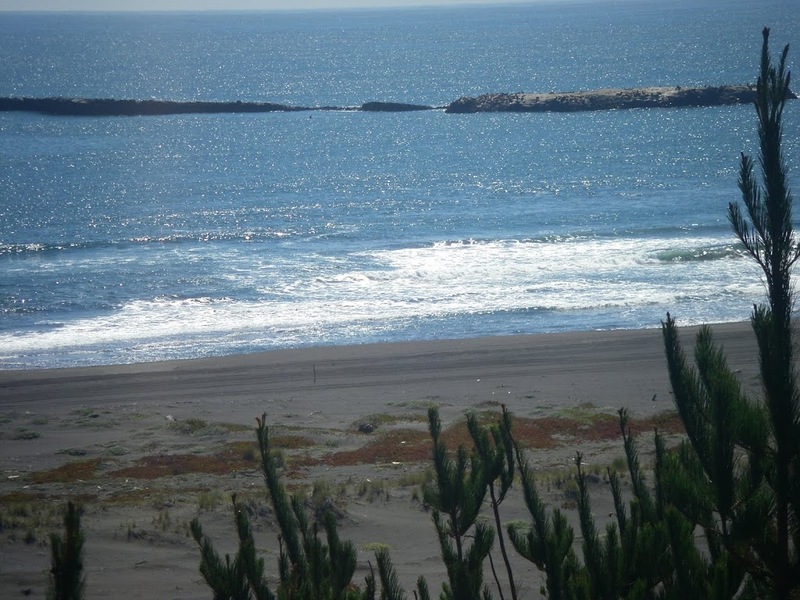 We sat on the porch and marveled at how pacific the Pacific Ocean was, not a normal condition, and how low the water was around the long rib of rocks protruding into the ocean from the shore near where the Carranza lighthouse is. This group of rocks is inhabited by hundreds of sea lions (called lobos locally), and this afternoon, without the normal high winds and rough surf, the lions produced a guttural din so loud (and an occasional whiff of guano so strong) they seemed to be right next to us. With the dust from our journey from Santiago finally washed from our throats, we drove to Loanco for dinner at Las Rocas. As we drove down the hill into town, a weird feeling hit me. I knew why immediately, but I couldn’t say anything. What I was seeing made no sense; I was dumbfounded. There were no boats in Loanco! No boats, no tractor to pull them out of the water, no flocks of seagulls picking over piles of discarded fish, no dogs running around, no refrigerated trucks loading fish, and most noteworthy..no fishermen. I was shocked to say the least. Incredible as it may sound, the artisan fishermen of Loanco, with their new boats and motors made possible by donations received after the tsunami, had decided to move their boats out of Loanco, seven kilometers up the coast, to Punta Pacoco, a spot they claim is more appropriate for launching and landing their boats. I have been told that as a result of the earthquake and tsunami in 2010, the geophysical characteristics of the ocean floor at Loanco were modified, resulting in what we observed earlier as a lower than normal sea level. But as I have already discovered, sometimes there are more than just one story in Loanco; so it is in this case. An attempt is being made to install a coal burning power plant in the Pacoco area, and the fishermen object, believing their fishing will be negatively affected by the plant’s contamination of the water and air. Could it be that they moved their base of fishing operations closer to the potential site of the controversial project so their presence makes it even harder for officials to approve the project? 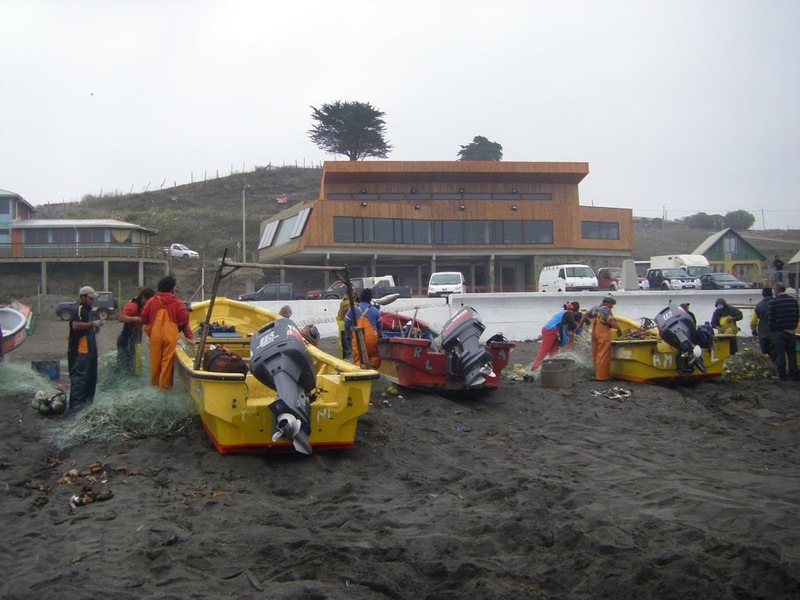 Regardless, the fishermen and their families still reside in Loanco, and visitors can still find a boat captain or two who will take them to observe the sea lions. 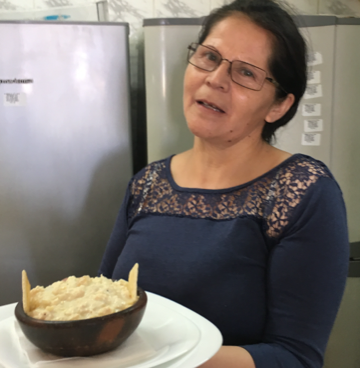 Dago and Maria still produce excellent food at the new Las Rocas restaurant, which still has the best view on the Maule coast. Bummed out by this new turn of events in which the sea again gives to Loanco with one hand and takes away with the other, we still enjoyed a great meal of locos with salsa verde and fried merluza, and another bottle of cold white wine. The long beach that extends from Loanco all the way up to the foot of the Carranza lighthouse, above which sits Joaquin’s and Veronica’s home where we were staying, is still a seafood gatherers paradise, occasionally giving up to the alert beachcomber edible seaweed called ulte and cochayuyo, and delicious remadora crabs. 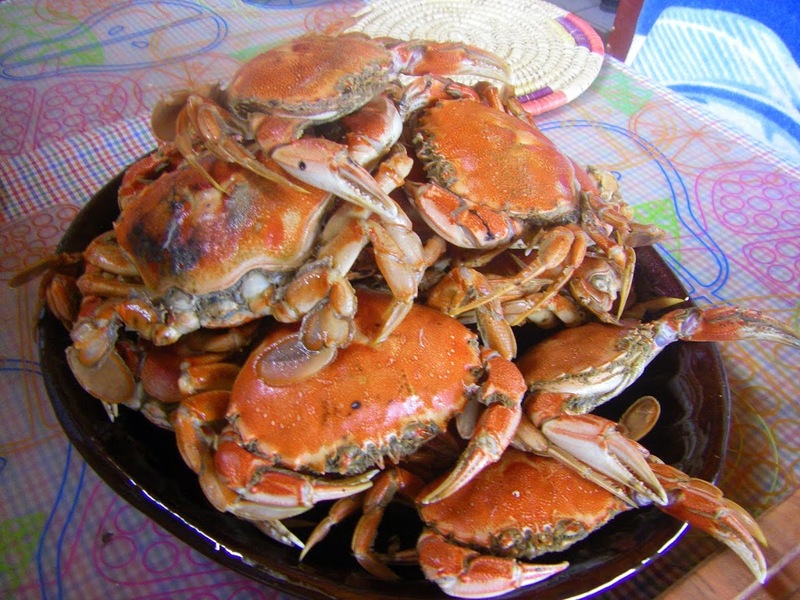 These, when combined with fried or grilled filets of corvina and merluza, raw or steamed cholgas, locos, erizos still provided by the artisan fishers from Loanco, make this still a seafood lover’s dream. 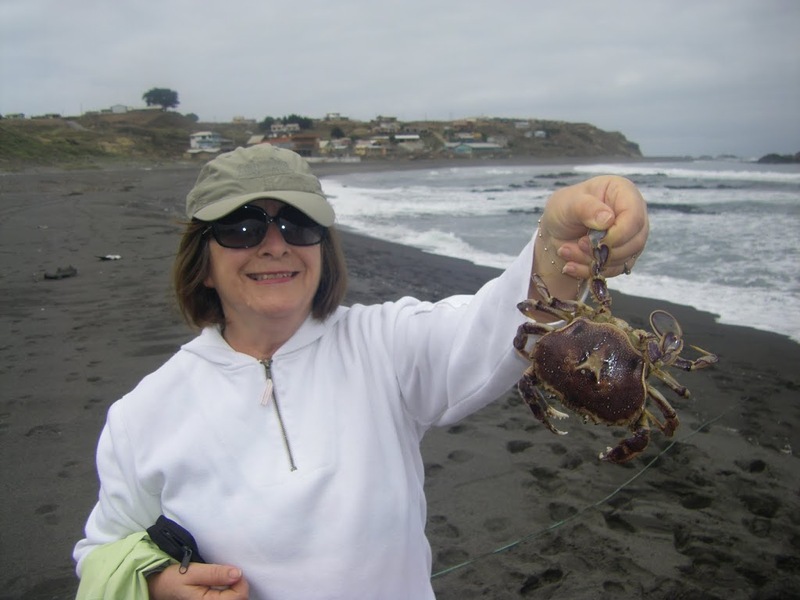 The crabs were coming ashore as we walked back from our lunch at Las Rocas, so we collected a bunch and had them for dinner, again preceded by pisco sours and accompanied by cold white wine, this time Moncho’s golden Chardonnay. Loanco’s shores are more desolate and less interesting without the boats and their daily activity of going out to sea and coming in with a catch (or not). The newly finished fishermen’s equipment storage and fish processing facility, including the cafeteria, ready to be put into operation, stands vacant. Unbelievable, and sad, but true. The Santos del Mar are still there, and the Virgin, they tell me. Maybe they are working on the next chapter of Loanco’s struggle with the sea. Let’s hope the next time something big happens, the sea gives more to the good people of this distant corner of Maule than it takes. 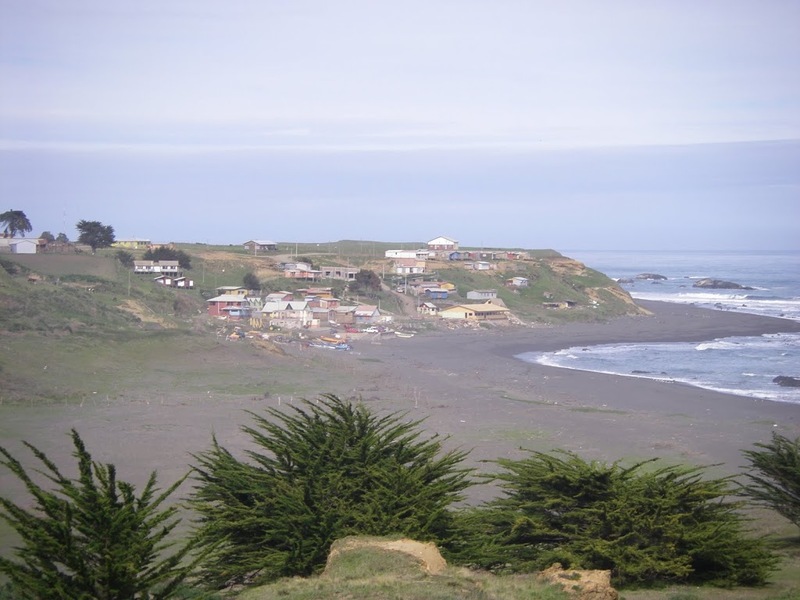 I love a good and loyal reader….yes, this is a compilation, edited and enriched, of several postings and parts of postings I have done on the Maule coast since the 2010 earthquake and tsunami. And I have become attached to Loanco; it helps to have a place like Joaquin and Veronica’s where I can stay and enjoy the area. 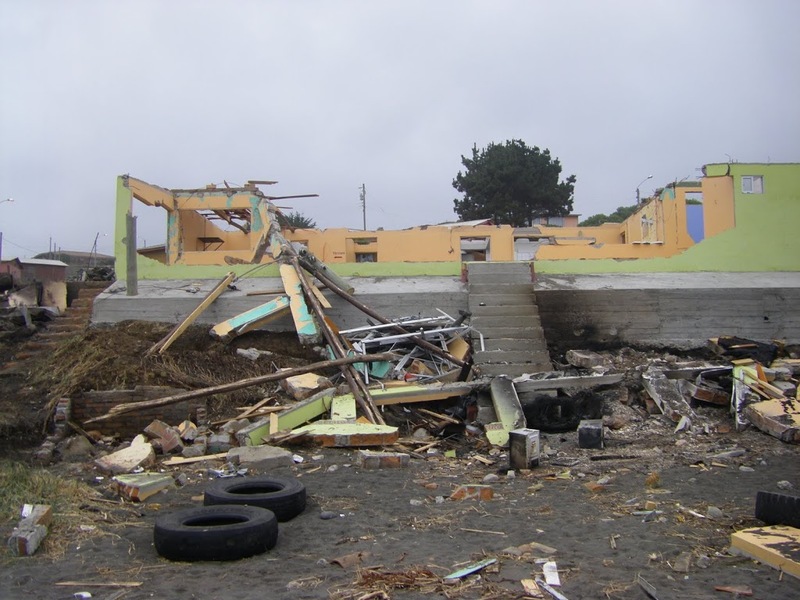 This next summer I hope to do the same for the towns of Chanco, Pelluhue, and Cunaripe, all destroyed in the disaster. 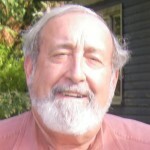 Great blog piece Dave. 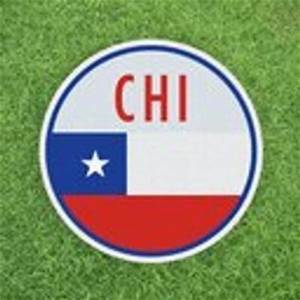 It brought us back to our trip to Chilean coast back in 1976. Abrazos.